Washington, D.C. — Students who attend “deeper learning” network high schools are significantly more likely than their peers in other schools to enroll in college, particularly in four-year and selective institutions, according to a new study by the American Institutes for Research (AIR). Schools focused on deeper learning aim to enable students to transfer knowledge and skills across contexts by developing academic and problem solving skills, enhancing their ability to communicate and work with others, and cultivating the self-knowledge and ability to manage their own time and effort. The AIR brief, Deeper Learning and College Attendance: What Happens After High School?, funded by the William and Flora Hewlett Foundation, focused on more than 20,000 students in 25 schools in New York City and California with largely diverse and underserved populations. Using a sample of similar schools, the team made statistical adjustments to compare students in network to non-network schools as both groups entered high school. The students entered ninth grade between the 2007-08 and 2010-11 school years. Roughly 53 percent of students who attended network high schools in the ninth grade enrolled in college by the end of 2014, compared to 50 percent of students in non-network schools. Twenty-two percent of students who attended network high schools enrolled in four-year institutions, compared to 18 percent of students in non-network schools. For selective four-year schools—defined as four-year institutions where more than 80 percent of incoming freshmen are full-time students and where admissions test scores place the institution above the 40th percentile of postsecondary institutions—the research found that 9 percent of students from network schools and 7 percent from non-network schools enrolled. Among students who enrolled in college, 69 percent of network school students enrolled the fall immediately following expected high school graduation, compared to 65 percent of their peers in non-network schools. Nonetheless, rates of retention and consecutive enrollment were similar regardless of whether the schools attended were part of a deeper learning network. In both groups, 80 percent of students enrolled for at least two consecutive terms, 62 percent enrolled for at least three consecutive terms, and about half enrolled for at least four consecutive terms. The effects of attending a network high school on college enrollment did not vary by gender or students’ eligibility to receive free or reduced-price lunch (a measure of low-income status), but they did for students with varying levels of prior achievement. Among freshmen who started high school with below-average achievement, students in network schools were more likely to enroll in college (by 5 percentage points) and more likely to enroll in four-year institutions (by 6 percentage points) than students who attended comparison schools. The study team did not observe significant differences in postsecondary enrollment among students who entered high school with above-average achievement test scores. 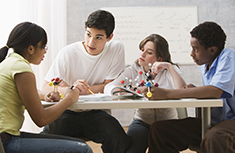 Using a sample that includes additional pairs of network and non-network schools, and an additional group of ninth grade students, this study builds on the findings of the 2014 report, “Evidence of Deeper Learning Outcomes.” That report also found that students in high schools that focused on deeper learning scored higher on standardized tests, had higher rates of graduation within four years of entering high school, were more likely to enroll in four-year and selective colleges, and had higher levels of collaboration, self-efficacy and academic engagement. The new study can be found at www.air.org/deeperlearning.